Well, that was the season that was. The season where Blackpool almost achieved the impossible, when they won many friends and played some unforgettable football. As the season ended an era was brought to a close and Blackpool will enter the new season with a new first choice eleven and new expectations. The end of each season sees the gradual whittling away of a squad; players being released and sold on. Blackpool have already said goodbye to a swathe of players and added to this, it is likely Charlie Adam will leave along with others. Before going in to the details about where Blackpool go from here, it’s worth establishing who is considered a part of the squad for the purposes of this article. Players such as Ashley Eastham, Tom Barkhuizen, Louis Almond, Chris Kettings, Adam Dodd and Liam Thomsett should be considered as potential loanees unless any have made significant strides in their development and impress in pre-season. Also factored in here is the ‘worst case scenario’ that DJ Campbell leaves as well as both Stephen Crainey and Matthew Gilks rejecting their contract offers. The current squad is detailed below. 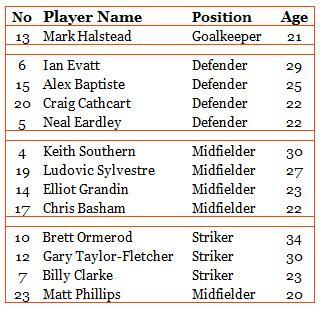 In total, that gives Blackpool a ‘skeleton’ squad of fourteen players and clearly this needs to be built upon. If they were to play a game right now, how would Blackpool shape up? As you can see Blackpool have obvious gaps that will require filling. This also places little consideration on striking a balance in midfield between craft and steel as well as assuming that Ludovic Sylvestre will still be around for week one of the new season. There are considerable doubts about his future and that of Elliot Grandin. However, Sylvestre has been featured here for two reasons. Firstly, he has the passing ability and vision of Charlie Adam even if he is lacking in Adam’s drive, aggression and direct goal threat. Secondly, because back in March Ian Holloway singled him out as a player he considered to be integral to Blackpool’s future. However, given that Blackpool are playing Championship football this season and he struggled to grasp the language, then it wouldn’t be a surprise to see him depart. When Ian Holloway arrived at Blackpool he talked about having a squad of twenty-four players made up of different ages bracketed in to four broad categories. Apprentices, young, senior and experienced professionals*. You can see the assumed quotas for each age profile below which gives a measure against the vacancies in each bracket. During his time in charge of Blackpool this may have flexed from time to time but it’s safe to assume that he will be building his squad around similar principles as well as ensuring that he has at least two players to cover each position on the field. 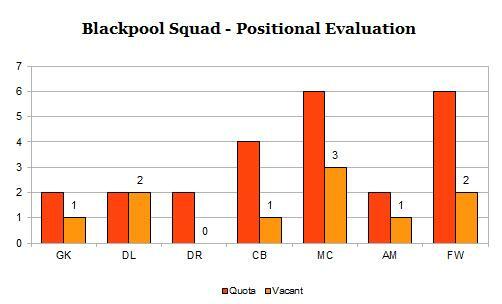 You can see below the current squad composition compared against positional vacancies. 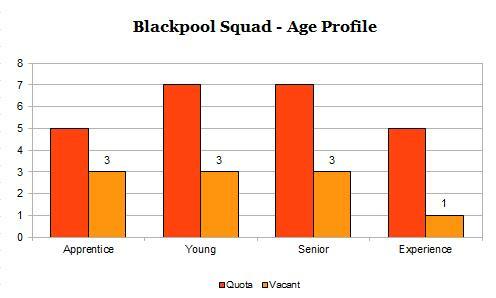 Blackpool need at least ten players, you can see above where the positions need filling. What does this mean for Blackpool’s recruitment this summer? Given they’ve got a squad of approximately fourteen players then they’re about ten short of where Holloway will want to be and on the chart above you can see what positions need to be recruited. What types of players may be expected to arrive on the scene at Bloomfield Road given the situation outlined above? Obviously a goalkeeper and a left back are priorities. Given Holloway’s system then the keeper needs to be comfortable with the ball at his feet and the left back needs to be comfortable pushing high up the pitch. In the centre of defence an experienced defender might be targeted and he may be left footed which might ensure a switch for Ian Evatt away from his left centre back role. A left footed centre back would serve two purposes, give better balance to the back line and facilitate a smoother recycling of the ball across the back line. Another factor that Holloway might seek in this new centre back is pace in order to give him more comfort in playing a high line. Further up the pitch the requirements become more widespread and it’s fair to say that a mixed bag will be arriving at the seaside, however, high-profile direct replacements for Charlie Adam and DJ Campbell may well dictate how the rest of the recruitment pans out. Another thing to consider is internal shuffles along the lines of when Holloway took over and he converted David Vaughan from left wing/back to central midfielder. A possible move along these lines would be Neal Eardley in to central midfield. He has the technical skills and a good passing range to operate in that position. He was tried out in central midfield in the last pre-season, at the time it was assumed that was to build up positional awareness and stamina, however, Holloway deployed him in that role against Wigan for the final moments of that game. Should this be the case then a right back may well be recruited to cover that shuffle. This is not an exhaustive analysis but serves to show the process that will be being pursued. Finally, what should be expected from Blackpool when they take to playing again? It’s fair to say that their formation will start the same. 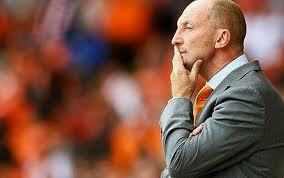 However, arguably Blackpool start this season with more formation options than a year ago. Holloway will likely start with either his 4-3-3 or 4-2-3-1/4-2-1-3 and he may also bring a 3-5-2 in to play more often. Perhaps when he feels that a team has countered his 4-2-3-1 and isolated the attacking players and when he needs added lateral midfield width to break from deeper areas especially when the opposition are fielding one man up front. Strategy wise it is safe to assume that Holloway will keep attacking from the first minute and perhaps he’ll cast off his attempts to stifle a game as that proved to be fatal at times last season. Tactically he may also ask his team to play the same, however, ‘build up play’ may be more around short passing in the deep and less about stretching the play due to the loss of Adam’s passing abilities. Defensively he may well persist with the high line and offside trap, however, knowing when to use it has been an issue in the past and not having the players with the right positioning, anticipation and pace to play in such a way does temper the effectiveness of the tactic. It might be that Holloway works with the defensive unit to build more lines of cover in so that they sit a little bit deeper and he may look at his defensive phase and decide to work on a different scale. At times Blackpool were working to 5 or 6 men behind the ball in the defensive phase last year, whilst he might ask them to work more towards 7, 8 or 9 for added security. The biggest tactical lessons that Ian Holloway may well have learnt from the Premier League is to understand how he wants his team to shape up in the attack to defence transition of the game. Any team who purposely broke up a Blackpool attack and attacked directly themselves gained an advantage as did teams who cleared wildly, only to see that Blackpool had pushed to high up and lost position. Perhaps Holloway may well attack in fewer numbers. Or perhaps, he will ensure that his players are more well-drilled in recovering their shape. The task ahead of Ian Holloway and Blackpool is quite significant and this should help to put that task in to perspective. It’s likely that he will have identified his key targets by now, however, identifying those targets and bringing them in are two very different strands. The key to the whole of this process is for the recruitment to happen swiftly and smoothly giving Holloway maximum time with his new squad to ensure a strong start to the new season. This is the final post of this season and it will act as a marker for the new season when the blog returns in late July. Thank you for your support and for reading the blog over the course of the season. Thanks also to everyone who has helped me with aspects of the blog and thanks to anyone who has spread the message of the blog via forums, websites, social media and word of mouth. *This is from memory and no written record is available to back this up.